Apple, like all pome fruit trees at planting require a large stock of organic and mineral fertilizers. Moreover, these fertilizers should be made available to tree form. Thus, fresh manure is undesirable, it decomposes more slowly than compost soil. Apple, mineral and organic fertilizers, barrel, water, watering can, bucket, shovel. 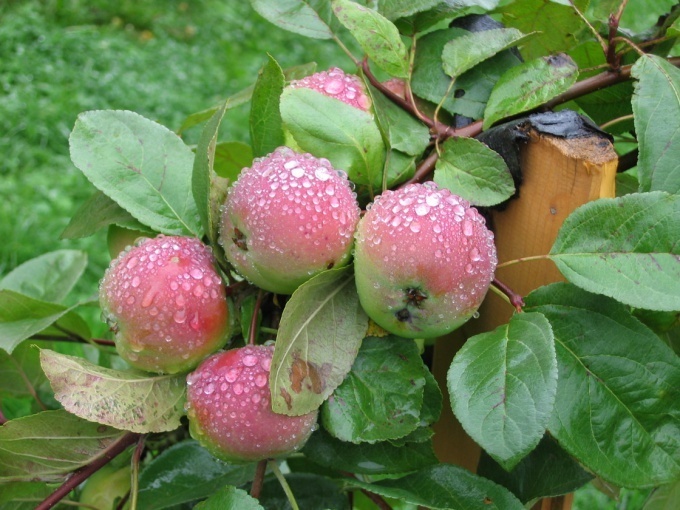 Provide a multi-layer fertilizer for Apple trees are still at the stage of planting a tree. Dig a hole with a diameter of about 3 meters, a depth of about a meter. Fill it halfway with bark of old trees, sawdust, etc., Spray the ground with Interom" that will protect from harmful insects. Tamp the crust, tread on it. Typically, these materials decompose in 2-3 years, so it is fertilizer for the tree we saved in reserve. The second layer – rotted manure or compost. Don't feel sorry for him, he is the key to the normal growth of fruit sapling this year. Place the root of the tree in the hole so that the site of inoculation (lumps on the lower part of the trunk fairly close to the rhizome) is left above the ground. If it is buried, that Apple much later will be included at the time of fruiting of the Scion will be forced to form its own root system, and not to use the roots of the rootstock. Pour the rhizome fertile garden soil. Tamp. Draw shovel handle tree trunks, liberally pour. Spend the first feeding of fertilizer about two weeks after planting. If planted an Apple tree in the spring – preferably a nitrogenous fertilizer. The trees planted in the fall, more responsive to potash. Take minerals at the rate of 20-30 g of urea or 15-20 g of potassium nitrate in a bucket of water. As it should stir, pour under the tree, trying to get into tree trunks. Next year in spring, feed the tree with liquid manure. This is one of the best organic fertilizers. For its preparation mix the manure with water in a ratio of 1:5, allow to ferment in the sun for 3-5 days, pour under the Apple tree. After fertilizing with liquid manure tree trunks dig. A couple of weeks, about the middle of may, make the minerals containing magnesium, boron and molybdenum. When on the trees the buds begin to appear, the application of liquid fertilizers, repeat. This time take the solution fermented weeds. This technology is called "fermentation". 10 kg of weed pour a bucket of water, leave in the sun for a week, then strain. This fertilizer is one of the best for young Apple trees. In the middle of summer (for trees that have already joined the fruiting season, "point x" is the beginning of the active filling of fruit) again make liquid manure. Autumn apples good pour: under every tree pour at least 50 liters of water. Considered, so they will be easier to spend the winter. And then in tree trunks make about 50 g of double superphosphate and lightly dig the ground. If you decide to feed Apple trees with bird droppings, be sure to let it pereplet, after which dilute with water, otherwise the trees can get burned. Fertilizing Apple trees phosphate fertilizers, do it in late autumn. It is desirable that trees "sleep", that is was beyond the time of intensive growth.